This is my Play dough recipe. As I have used this recipe for over 30 years, I don’t remember the source but I noted that there was one very similar on the back of a packet of Cream of Tartar. 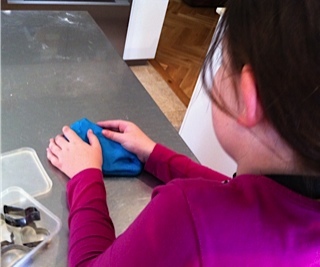 This recipe makes a very malleable play dough that doesn’t stain and is easy to clean up afterwards. Put all the ingredients into a medium sized saucepan, place over a gentle heat, and cook for about three minutes, stirring all the time to blend well. Remove from the heat, and tip onto a bread board to cool. When it is cool to touch, knead it for a minute to ensure it has blended well. Enjoy. This entry was posted in Food, For children and tagged play dough on December 17, 2013 by lorikeetlady. I lay in bed hoping that the crescendo of rain on my bedroom roof indicated that it might be easing off not because I don’t like rain but tomorrow I was playing Granny for the weekend with a 2-year old grandson. My idea for a picnic at Southbank was dissolving faster than the sugar on the scrumptious doughnut drops I had planned to buy at the local markets for breakfast. There was no way I could see myself managing to juggle child on hip, basket over the shoulder, umbrella balanced precariously under chin whilst buying groceries even with a soggy husband nearby to carry the parcels. Lying there, I sifted drowsily through 30 years of memories to remember how I had entertained my three small children during wet days over summer. blue gluggy mess that my niece helped me make very early the next morning. Thank goodness I hadn’t thrown out the wonderful recipe for play dough that is such an easy mixture for children to cook. Hours of fun later, whilst I made chocolate cupcakes Harry made blue muffins to serve Grandpa with his coffee. Now I am pleased that our concrete driveway has a few depressions in which the rainwater pools. These provided endless opportunities to splash the inquisitive cat. The wisteria canopy filtered the light rain and Harry and I revisited those wonderful childhood memories of splashing through puddles. Afterwards my budding miner put buckets of sand in the water and wriggled his toes through the slush. I now have a fine dusting of sand throughout my tiled floors reminiscent of beach holidays. A future engineer in the family. However, the pièce de résistance was our firewood pile. We had cut into small lengths the floorboards that we had replaced from our front landing. These provided hours of entertainment as Harry constructed bridges, tunnels and roads beneath my washing line. I was redundant; he was engineer and project manager as he put together metres of highway. 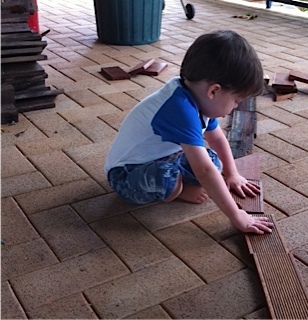 When he ran out of his supply of clean boards, he would carry pieces into Grandpa’s study asking for assistance in removing the nails from the lengths I had set aside. Watching from a distance with a coffee I realised he didn’t need the bright colours or complex connecting shapes. He was completely happy just placing the lengths on top of each other, beside and end to end. Occasionally he would drive his Matchbox car along the route making car sounds but most of the time he constructed and pulled apart his highway. Not once over the weekend did we need to turn on the television or computer games. He was totally absorbed playing with dough, sand, water and timber. Occasionally he would sit and draw me a picture, and when tired we would read books. The joy was in watching this small child use his imagination to entertain himself. I was always there watching, encouraging and interested but rarely was I needed to participate. Exhausting but rewarding. I did have a wry smile to myself when later that week, my son who had been babysitting for a day commented on how little time one got to do things and how intense it was when looking after a small child. Tell me about it. This entry was posted in Families, Food, For children and tagged Grandmother, play dough on December 17, 2013 by lorikeetlady.